Mookie Betts hit a walk-off solo home run leading off the bottom of the 10th inning as the Red Sox beat the Twins 4-3 at Fenway Park. Craig Kimbrel endured a brutal ninth inning giving up a pair of walks and a two-run double as the Twins took a 3-2 lead. Rafael Devers tied the game in the bottom of the ninth with a laser-beam home run. Jackie Bradley Jr. (pictured) slammed his eighth home run of the year to provide the first two runs of the night for the Sox. Chris Sale started for Boston and made history, recording his 200th strikeout of the season in just 136 innings, the fastest ever for an American League pitcher, breaking his own previous record of 141.1 innings. The lefty went six innings in the no-decision outing. He allowed just three hits and walked two while striking out ten. He lowered his ERA to 2.04. Sale has also struck out 200 batters for the sixth consecutive year. 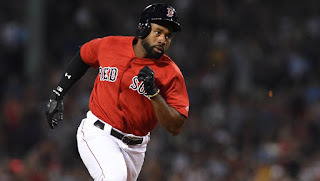 One night after striking out with the bases loaded in the ninth inning of a one-run loss, JBJ appeared to have provided the Red Sox with all the runs they would need on an opposite field home run in the bottom of the fifth inning with Eduardo Nunez aboard. Until the ninth, the lone Minnesota run came off reliever Ryan Brasier in the seventh inning. Matt Barnes recorded a pair of outs in the eighth before giving way to Craig Kimbrel.